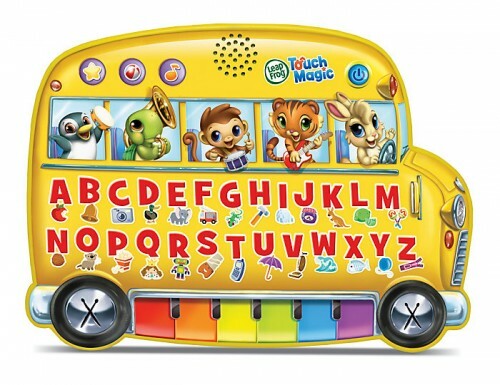 Home Entertainment	New from LeapFrog: Touch Magic toys! I’ve said it before and I’ll say it again. We love LeapFrog! My boys both love the interactive toys and I love that they are always learning something with Leap and Tag and the gang. We recently had a chance to check out two of the newest toys from LeapFrog with a few friends and once again, they did not disappoint. The big boys got awards for checking out the new toys! The Learning bus was a big hit with Erin’s little one ! Meet the Touch Magic Rocking Guitar (3+ years) and the Touch Magic Learning Bus (age 2-4)! Each toy retails for $24.99 and both offer a range of learning fun. Oscar and his buddies had a lot of fun taking turns (yes really) with the new toys and checking out what they had to offer. To my surprise, the Learning Bus was the big hit of the day! The kids loved that you could identify letters and sounds and still have the option to play music on the little piano (with bonus drums in the wheels)! I love that the toys are a smooth surface that is easy to clean and compact to make storing them super easy. And with the wide age range, both my 3.5 year old and my 1 year old can enjoy them! • Includes guitar, percussion and special effect sounds—even applause. • Ten different learning songs let little musicians layer in sounds and create their own unique music. 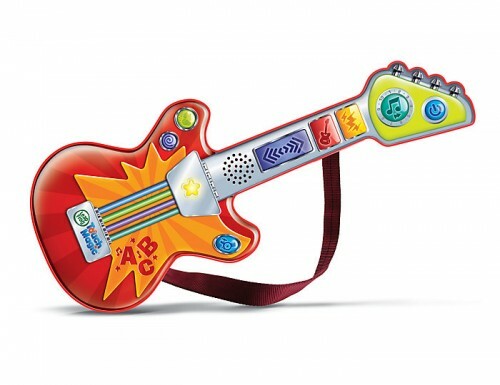 • The Touch Magic Rockin’ Guitar is appropriate for children ages 3+ years. • Parents can connect to the online LeapFrog® Learning Path for customized learning insights and ideas to expand the learning. • Make a movement or touch a sensor to activate the bus and get the learning journey rolling. • Switch between 3 modes: Learning, Letter Exploration and Music, which includes fun sing-along songs about the alphabet, motion and more. • The Touch Magic Learning Bus is appropriate for children ages 2+ years. 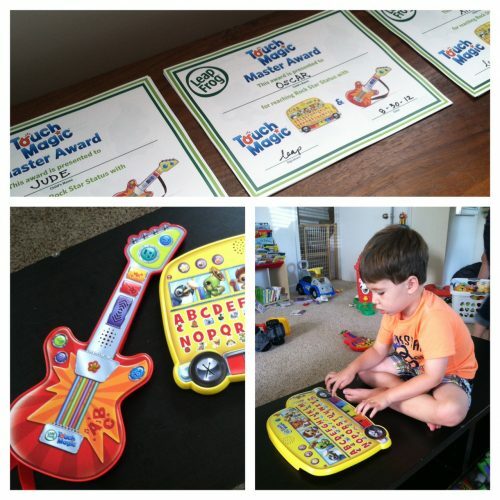 Have you seen the new Touch Magic Toys from LeapFrog yet? What do you think? Disclosure: I was provided with the above toys to facilitate my party and this review through MomSelect. All opinions are my own.